Our home Removals St Albans services are suitable for all types of moves. Making sure that your belongings are transported safely from your old home to your new one can be stressful unless you have furniture movers who you can trust to get the job done safely and efficiently. 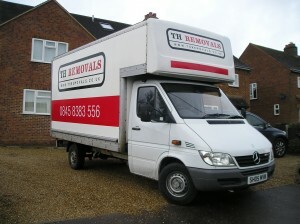 TH Removals provides reliable, low cost furniture removals in and around St Albans & Harpenden area. Our house removals services can take care of moving your furniture so that you can focus on enjoying your new home. Hiring an experienced house removals company is the best way to ensure your move goes smoothly. Plenty of moving companies in both St Albans or Harpenden will try to convince you that they are the best, but we believe that a good house removals St Albans service speaks for itself. If you are looking for home removals companies in St Albans or Harpenden, you should spend some time exploring our website and learning about how we can help with your move. You can even get removals quotes St Albans to find out how much moving into your new home will cost. You will see that TH Removals offers an affordable, efficient home removals service in Hertfordshire, Bedfordshire and Buckinghamshire. Our experienced house and flat removals St Albans team can move your belongings safely, whether you are going a few miles down the road or across the country. We don’t make big claims about our services. We just do the work and let our client testimonials speak for us. We offer moving van hire with a team of expert furniture movers. Our experienced moving service can organize your home removal for you from start to finish. We know the area well and can make sure that your furniture and other belongings reach your new house on schedule. Our house movers also know how to pack everything safely for transport in the van. We treat each job individually to ensure that you get the best service. We can organise house removals St Albans for large family homes, or handle speedy flat removals St Albans when you need to move quickly. Our removals services in St Albans can eliminate the stress of moving. TH Removals offers reliable low cost house and flat removals in both St Albans & Harpenden with services that you can trust to keep your belongings safe. Our experienced removals team will handle every item we move with the care it deserves. Our fleet of fully serviced vans are all protected by an all risk removals insurance policy covering each load up to £15,000. Moving house can be an expensive process. If you want to find out how much it will cost to move your furniture, you can check our pricing page for information on house removals costs or ask for a quick quote online. Our removals quotes St Albans offer a low cost option for moving house. Get in touch today to find out more or to arrange a home removal in St Albans.